It does not pay for me to freak out, I have learned, which is not to say that I will not freak out five times before next, say, Thursday. And like I said, it is all relative. In particular, this little of nugget was relative to an A-bomb that was detonated (also in the car) three days earlier, of the variety that often requires sedation. I did freak out a little for that one, briefly, because it was both ancient information and gravely serious and I was just finding out now. It rattled me for a few days, and was thankfully tempered by my best friend's gracious receipt of my story-vomit. You know what I mean, ladies. The kind of thing girlfriends do for each other when something monumental has come their way without warning. You basically hold your hands out and prepare to receive a "download". It's a reciprocal act among the closest of friends and you must be prepared to do it in any location: a restaurant bathroom, a coffee shop booth, a parked car on a quick store-run away from a barbecue. It is an emergency debriefing and you do not have to be able to handle it, you just have to pretend you can. This week got me thinking a great deal about the bomb blast moments in life, the grenades that fall in our laps on the most gorgeous days. And how no matter how they are handled, you can never negate the fact that they create a cleave in time. There is always a moment before and a moment after The Knowing that cannot be erased. We are almost always subjected then to a repeating loop, a split-second montage of shrapnel bits reversing to become a whole grenade. For some time after, there is that repeated pause, rewind, replay sequence that forces you to remember yourself in that innocent but now shamefully ignorant moment just before you found out. Before that ugly fact, before that bomb. It could be a death, an affair, a firing, a miscarriage, an unexpected disagreement between friends, what have you. There is always that moment when someone could - if they had the power - reinsert the pin. Nothing, I think, is more cruel than the moment that repeatedly arrives with the first few mornings of fallout. In fact, forget the moon landing. Humans have really accomplished nothing of significance if they have failed to invent a pill to erase that bile-filled mental hiccup that occurs a few seconds after waking up….normal….normal….wait, there's something I should remember………Oh yeah. That's it. "X" happened. The knowledge we can live with. It's the forgetting and remembering. Yes, Eli Lilly. Get on that, would you? "Don't you know? If you ruin a family for another woman, you are supposed...to...TRADE...UP!" After it landed somewhere on his neck like the product of a good cough, I clearly remember thinking two things: 1) They don't mention anywhere in the scorned-woman handbook that uttering such ugly yet justified-in-the-moment statements only feels good for about 1/2 a breath longer than the last word spoken and then simply becomes a stain on your character; and 2) THAT line would have been hilarious…if this was a movie based on a Nora Ephron novel. I really wish there was a 'human dashboard' option to switch brimming emotions to stealth mode. You know, those frustrated sleep-deprived tears that threaten to bust through at the most inopportune moment. And the fact is, I rarely shed tears but Internal Crying would be so pleasant for everyone involved. By my design, they would be as unnoticeable as Kegel exercises. Yep. These are the things I think about while shrapnel is flying around me. I dream of the day I can stand in the produce section, assessing the ripeness of an avocado, while also having a damn good cry on the inside. Nothing is sacred here! Well, not exactly. Some things are still off limits, but the rest - the mundane experiences of human existence and the life-altering moments we endure - are filled with both latent comedy and mind-boggling tests of character. It can't all be funny, but sometimes you have to choose: Laugh or Cry? 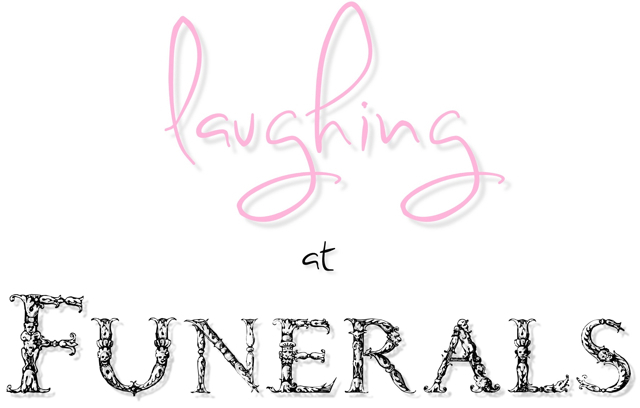 Copyright ©2012-2016 Laughing At Funerals & Whitney L. Darmstadt. All Rights Reserved.. Picture Window theme. Powered by Blogger.